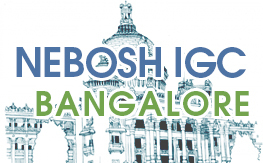 Why NEBOSH Course in Bangalore? NEBOSH International General Certificate (NEBOSH-IGC) gives students an excellent foundation at key insights on occupational safety and health standards and practices, as well understand & manage risk efficiently. NEBOSH qualification boosts the confidence level of participants and makes them independent safety professional who can manage workplace safety in any industrial set-up. Those who wants to start their career in Health & Safety as well aiming for higher education in occupational health and safety can do this course, and subsequently become eligible for NEBOSH International Diploma. This Certification is also a Qualifies the criteria for Technician Membership of IOSH and Associate Membership of IIRSM. All working professionals including supervisors, officers, managers, technicians, employee representatives, supervisors, or those looking for a career in health and safety sector can join NEBOSH IGC. Though NEBOSH has not formulated any specific eligibility criteria for those wish to pursue this qualification; Since the Syllabus & exams are set in English, the participants should have Learning, Speaking, Reading, and Writing skills in English. The National Examination Board in Occupational Safety and Health (NEBOSH) had produced several thousands of HSE professionals with its highly-reputed industry-oriented safety and health Qualifications. Strictly adhering to international safety standards and practices, NEBOSH courses are offered through a world-wide network of affiliated educational centres. Green World Group is a well-recognized Nebosh Course Provider (Centre No. 733). Students completing NEBOSH Certification are highly recognized, not only in Bangalore and India, but also in several countries. Green World Group is a pioneer institution offering reputed and highly-employable occupational safety and health courses to participants around the world. Some of the most sought-after safety courses students can avail at GWG’s Bangalore Chapter are NEBOSH, IOSH, International Safety Courses approved by CPD & RoSPA, IRCA Lead Auditor Courses and indigenously-formulated safety diploma courses. The courses are well-planned and tailor-made to fulfil the safety needs of industries and also for participants, who can serve as qualified HSE professionals. 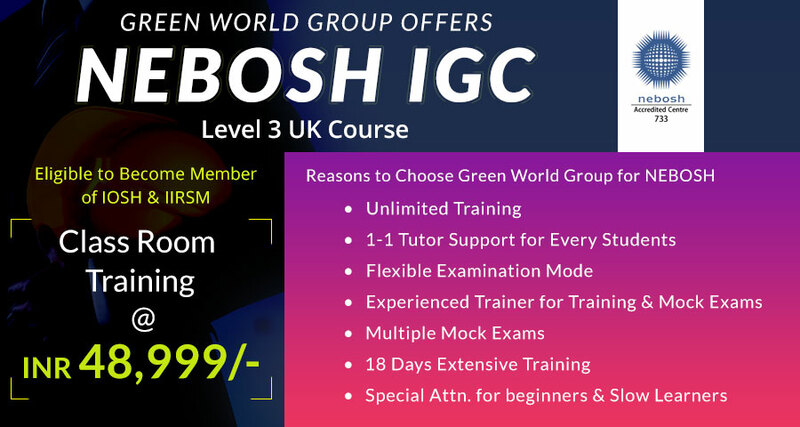 As NEBOSH IGC training offered at GWG cover all aspects and nuances of health and safety management, risk control, identifying workplace hazards and real-time application, students get all round knowledge and skills on Health & safety connected to different work environments. Sophisticated and well-thought-out methodologies are adopted to groom participants so as to make them competent HSE practitioners. All delegates are provided with advanced classroom infrastructure, individual attention from experienced tutors and well-researched course material. Apart from providing high-class NEBOSH training, students get advices and career counselling from well informed safety experts.